In spite of terrorismand looming war clouds in the Middle East, the prospect of a peace such as the world has never known seems to be a realistic hope. That the nations of the world will indeed establish an unprecedented international peace, and perhaps fairly soon, is certain, because the Bible has for thousands of years foretold a false peace in the last days. Are we suggesting that the world’s leaders shouldn’t even attempt to achieve global peace? Of course, they must try. But those who are not Christians, driven by necessity to pursue every possible means to establish peace, don’t realize the futility of their efforts. Christian political leaders, of course, are also compelled to join their secular colleagues in pursuing world peace. At the same time, they must declare solemnly and clearly to the rest of the world that the only true hope for global peace is to repent for having violated God’s laws, to receive Jesus Christ as the Savior who has died for the sins of the world, and then to ask Him to come back to this earth to reign. Where are the Christian political leaders with the courage to do so? And if they did, who would listen? To stand fully for Christ without any compromise would end any political leader’s career. Peter explained to the first Gentile converts after Christ’s resurrection that peace was to be preached through Jesus Christ (Acts:10:36). To most of today’s Christians, that is a radical thought. What pastor or evangelist on radio or television today is preaching global peace through Jesus Christ? Paul declared that this peace was both “to you which were afar off [Gentiles] and to them that were near [Jews]” (Ephesians:2:17)—and that this peace was only possible through Christ having died for the sins of the world (2 Corinthians:5:18,19). Those who set out to establish international peace through a world government over which the Lord Jesus Christ is not invited to reign are necessarily on the side of Antichrist. They are preparing the world for his rule, whether or not they recognize or acknowledge that fact. Such is the danger that attends all earthly efforts to establish international peace and unity. Then the master of the house being angry [at those who accepted his invitation, but failed to come to the feast and tried to cover up their unwillingness with pitiful excuses] said to his servant, Go out quickly into the streets and lanes of the city, and bring in hither the poor, and the maimed, and the halt, and the blind. How can we make such a definite declaration? Isn’t it dangerous to attempt to correlate current events with biblical prophecy? Indeed it is. Nevertheless, if Bible prophecy concerning the “last days” is truly inspired of God, the time must come when what the prophets have written describes current developments. The euphoria of millions freed from communist rule in Eastern Europe and the former Soviet Union was quickly followed by the misery of even worse poverty. Government oppression was replaced by increasing lawlessness, the influx of cults, the explosion of incipient immorality, corruption, and occultism. The Eastern republics witnessed an Islamic takeover with accompanying terrorism. Is history repeating its endless cycle? Humanistic hopes for a new and bet-ter world seemingly find justification in technology’s amazing promises. 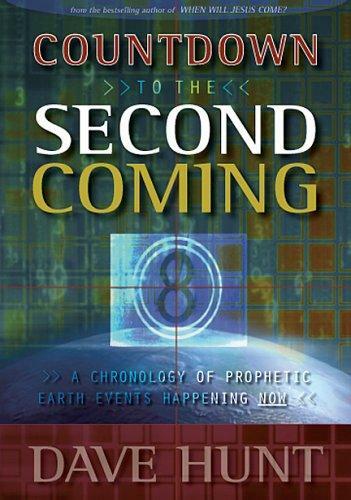 Yet biblical prophecy offers sober insights to those who will give heed. Winston Churchill was not deceived by Hitler, but he stood almost alone in warning the world that the Fuhrer’s real intentions would envelop Europe in war. Looking back with the clear view we now have, it seems incredible that the leading figures of the day were almost unanimous in their praise of the irrational demigod who had become Germany’s leader, and in their confidence that peace was assured. The deception was well-nigh universal. Yet the rising political star whom everyone praised was a dangerous megalomaniac who would one day take his place with the most inhumane monsters in history. Moreover, he had frankly revealed his evil designs from the very beginning, in Mein Kampfand other writings, and in his speeches. Yet so hopeful was the world for peace at any price that almost no one was willing to face the painful truth. So it is today. Like Churchill in England, Netanyahu is one of the few Israeli leaders who was not deceived by Arafat’s promises at Oslo. He wrote: “…my party and I were virtually isolated in our warning that Arafat would not keep his word…. We were widely castigated as enemies of peace…. Our argument was that handing Gaza over to Arafat would immediately create a lush terrorist haven….” Of course, he was right.